A song that Billboard calls “a smoldering ballad,” “Burning House” remains the highest-charting solo female song at country radio for a fifth consecutive week, currently #22 and #23 respectively on the Country Aircheck and Billboard country airplay charts. Fans can also watch for Cam in a feature story in this weekend’s edition of the CMT Hot 20 Countdown, premiering Saturday, August 29, at 9 AM ET/PT and re-airing at the same time on Sunday, August 30. This week, Cam’s “Burning House” vaults past 8 million streams on Spotify, where her Welcome to Cam Country – EP debuted exclusively earlier this year. Hear it at http://smarturl.it/spotifycamcountry. Cam recently talked about “Burning House” and much more in the Nash Next Artist Spotlight of the August 24 issue of Nash Country Weekly. The feature is also online at http://www.countryweekly.com/magazine/vault/nash-next-spotlight-artist-cam. Cam’s EP and upcoming full-length album are produced by GRAMMY®-winner Jeff Bhasker (Bruno Mars, Beyoncé, FUN., The Rolling Stones, Taylor Swift) and Tyler Johnson (Ed Sheeran, OneRepublic, Taylor Swift, Miley Cyrus, Mikky Ekko), with “Burning House” co-written by Cam, Bhasker, and Johnson. The EP is available for sale at http://smarturl.it/welcometocamcountry. 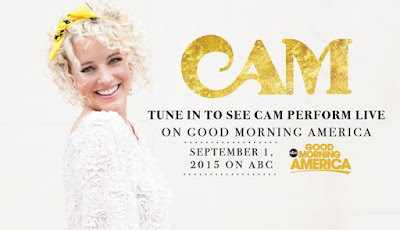 You can follow Cam on Twitter @camcountry and on Instagram at https://instagram.com/camcountry.